athlete, atlantis, bahamas, boomer, bounty, business, celebrity, charity, chasten, dealer, distance, eric, family, fast, Florida, for, fun, hobby, is, lagopoulos, like, man, marathon, new, photo, profile, race, restaurant, riva, rxp-x, rxt, sale, sarasota, Sea-Doo, shoot, single, soccer, sponsor, that, video, water, waterfront, world record, x-team. Eric Lagopoulos is a veteran PWC racer. The Floridian with Greek and French heritage has been a consistent figure at PWC races in North American as well as internationally for nearly 20 years. He has graced the pages of magazines in action shots and ads for BRP/Sea-Doo, he’s starred in videos but hasn’t hung his helmet on PWC racing alone. 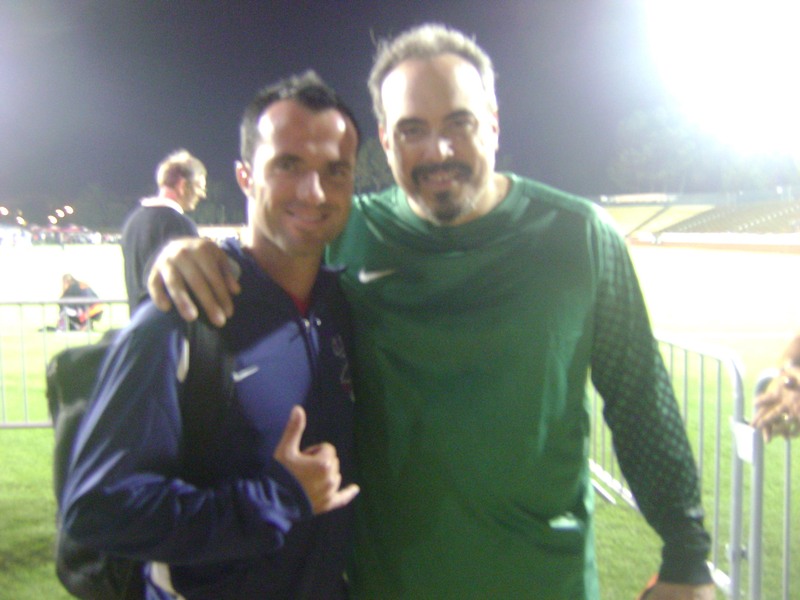 Lagopoulos is an active guy, competing in many forms of competition including marathons, celebrity soccer matches, setting world records, and competing in the business world. 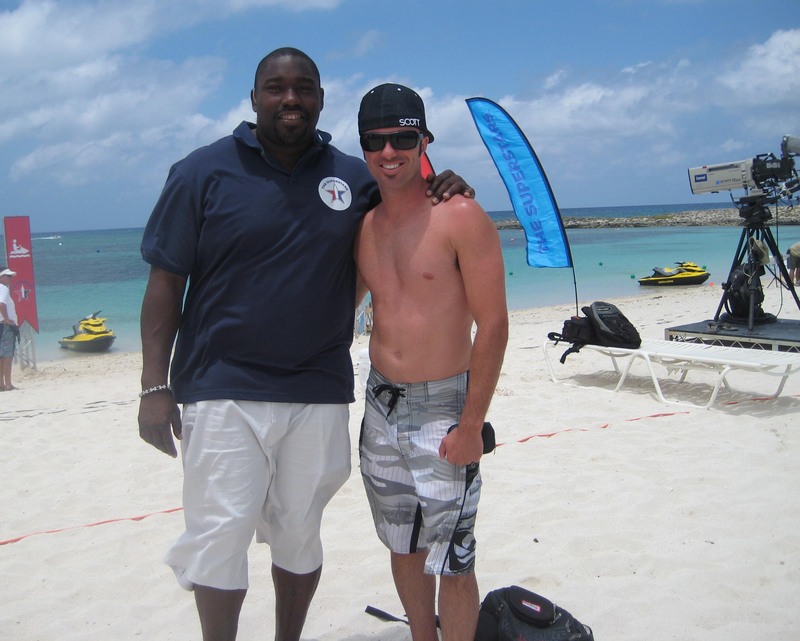 Lagopoulos is an everyday guy, active guy, who chooses to make his hobby professionally racing Sea-Doo watercraft. Masterful self-promotion is a skill hard to find among the ego driven PWC racing community…believe it or not, but Lagopoulos has leveraged his on-track success arguably better than any other PWC racer. His ability to interact with fans, sponsors, media, and people in general has opened the doors to unique opportunities few will experience but do exist for those who look for them. To use a tactic quoted from Sea-Doo PWC racing Legend Chris Fischetti “If you don’t win the race you better win the interview” could be applied to Eric Lagopoulos. Elevating your profile and building a fan base is sometimes the most valuable accomplishment in the long run. ONBOARD: Eric, where did you grow up and how was your competitive spirit developed? EL: I grew up in Sarasota, Florida (paradise USA!) My competitive spirit was developed from my dad who was a professional marathon runner. Racing just made sense, I love going fast and I love the water! ONBOARD: What do you do away from the water to stay on the water? What’s your profession? EL: I currently own and operate a seafood/steakhouse called The Waterfrontoo. It’s in Nokomis (Sarasota) Florida and I have been there for the last 11 years. It also has an awesome sports bar with 20 tv’s and tons of access to come by Sea-Doo! ONBOARD: Eric, How were you introduced to water-sports? EL: When I was kid, I was into all water-sports so naturally I ended up on a 300 cc stand-up and fell in love with riding. Eventually in the early 90’s I bought a Sea-Doo and that’s all she wrote, I’ve been riding a Sea-Doo ever since! ONBOARD: Eric, you have some accomplishments on PWC away from the racecourse, can you tell us about those? EL: Yes! On November 12, 2009 I was presented the opportunity to break the Guinness Book of World Records for 3 separate distance and speed records. It was an awesome chance to break the records on a Sea-Doo RXT iS and do it for a great cause, The Boomer Esiason foundation for cystic fibrosis. I ended up breaking 2 of the records including most miles on a pwc with 880 miles completed in 17 hours. ONBOARD: Your accomplishments riding Sea-Doo on the racecourse have opened some doors with some celebrity sporting events. How did this come about and what are some of the events you have been a part of? EL: Riding a Sea-Doo definitely has had its perks. The latest event was being invited to play in Brandi Chastain’s retirement soccer match. It was an awesome event that included a mix of athletes such as Mia Hamm, Brent Jones, and Kristi Leskinen. Celebs that played included Judy Reyes and David Zayas who is on my favorite show “Dexter”! 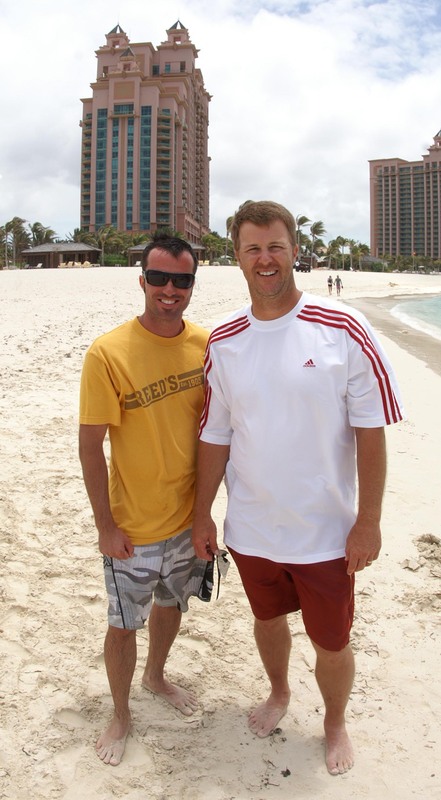 I was also involved with the “Superstars” a made for TV event shot at Atlantis in the Bahamas that included some celebrities and 5-star athletes such as Lisa Leslie (WNBA), Brody Miller (skier), Terrel Owens(NFL), and Jeff Kent(MLB). ONBOARD: Eric, Where is your favorite PWC race site? EL: Pattaya City, Thailand! It’s an exotic paradise with some of the nicest people I have met! EL: I can’t get away from the thrill! I’ve been racing since I was 15 years old and I enjoy today just as much! ONBOARD: Eric, where is your favorite non-racing, riding location? Or what is your dream ride? EL: I grew up riding at a spot called Bayside. It’s the northern tip of Longboat Key, Florida. It’s my absolute favorite spot to ride, it has rough water and flat water within seconds of riding. It creates a perfect training location with a perfect backdrop! EL: The Sea-Doo X-Team Bounty is a unique program that benefits any racer on a Sea-Doo. The program pays riders to get on the podium from novices to top pros. 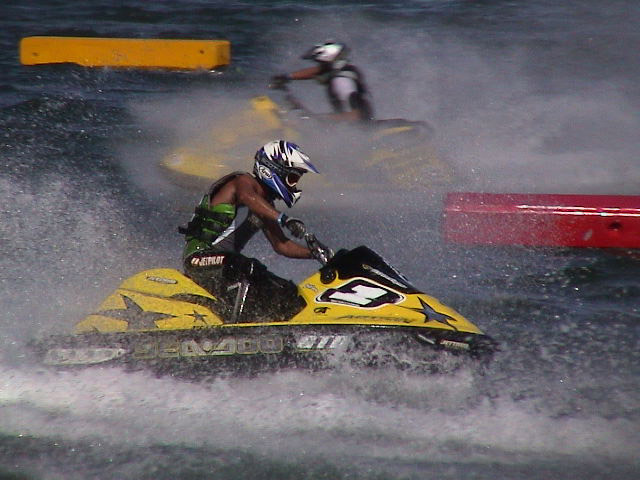 It also has cool incentives like the Sea-Doo Bounty Invitational that happens at the World Finals in Lake Havasu city, Arizona every year. It takes the top money winners for the year and gives them a chance to win an extra bonus check! I’ve been lucky enough to win 3 of them! ONBOARD: Eric, what are you racing right now and what are looking forward to and who is supporting your 2012 efforts? EL: I will be racing a 2012 Sea-Doo RXP-X 260on the US National Tour and World Finals with the support of: Sea-Doo, Riva, Pro-Marine, Scott, Relaxzen, HydroTurf, Wamilton’s customs, Team Mean and Roaring Toyz. BRP thanks Eric Lagopoulos for his time and dedication to the pursuit of PWC racing glory aboard Sea-Doo. You can follow Eric on his Facebook page.